Just your everyday film about a young girl (Ahn Seo-Hyun) who risks her life to save a giant pig named Okja, from the Miranda Corporation. Lead by CEO Lucy (Tilda Swinton), the company plan to slaughter it to feed a hungry population. Okja, a genetically-modified mammal, is one of 26 ‘super pigs’ spread around the world to be cared for by farmers, as part of a competition. Turns out, Ojka is the best one and now Lucy and her cronies are taking it back. For the past ten years, farm girl Mija has been raising her pet super pig with her grandfather in rural South Korea. This lovable creature has become part of the family and she can’t imagine her life without it. So, imagine how she feels when popular TV zoologist Dr Johnny Wilcox (Jake Gyllenhaal), turns up at their home, takes a few photos of the animal, then snatches it and heads back to America. She’s heartbroken but won’t stand for it. Determined to save her best friend, she grabs a bag, some money and goes on a crazy, comical adventure. Don’t bother asking how a girl that looks about twelve, manages to make it all the way to the other side of the world. This is one those films where you have to go with the flow, and if you’re looking for realism, watch something else. 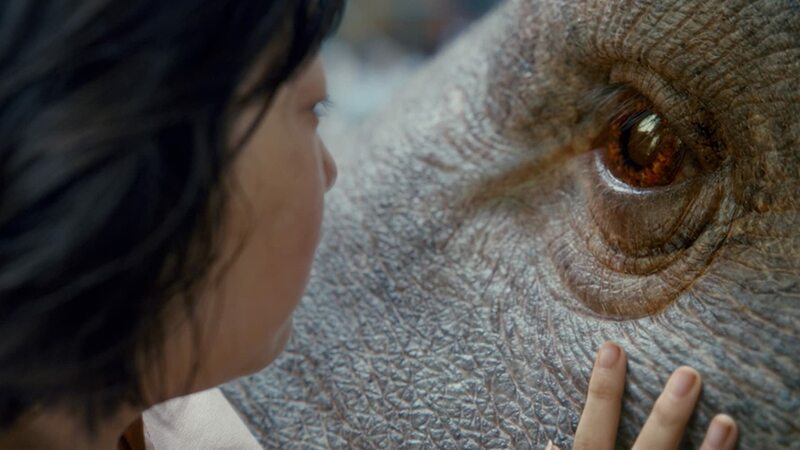 Without giving too much away, Mija gets help from the Animal Liberation Front, a group of activists who’ve made it their mission to set Okja free. But before they do that, they want to use Ojka so they can expose the Miranda Corporation for the monsters that they are. The company has a glossy public image that has duped the world. No one knows about the animal cruelty that goes on behind closed doors. So, while Ojka is an eccentric, comedy action-adventure, it’s actually a satire as well and basically an anti-industrialist movie. Director Bong Joon Ho has created an unrealistic, deliberately OTT world to explore deep-rooted societal issues. The unsubtle messages about animals and factory farming are something I thought worked really well. What’s the point of dancing around the issues? If you’re going to make a film that addresses animal cruelty, you might as well be upfront about it. Still, Ojka has some very curious tonal and pacing decisions. The first thirty minutes are as slow as you like, with the focus strictly on Mija and her oversized companion. Then the next thing you know, there’s explosive action sequences, like chase scenes and getaways. The plotting is frustrating, definitely not as well put together as I expected, but the action provides endless entertainment. Much of the film relies on the very physical performance from Seo-Hyun. It’s through her determination and love for Ojka, that makes us really believe in their relationship. 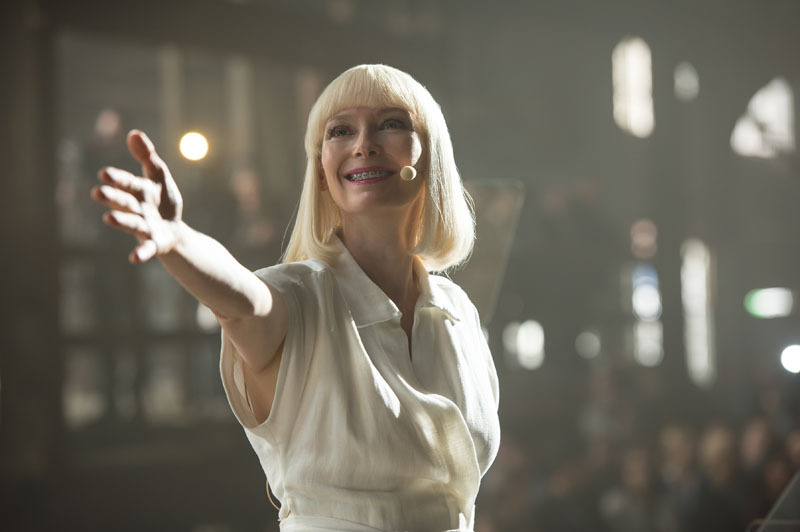 You would have to have a heart of stone not to care about Okja’s freedom. That awful Mirando Corporation has an unusual bunch of villains: with Tilda Swinton and Jake Gyllenhaal giving very animated performances. But be warned, this is a very different performance by Gyllenhaal, not something we’ve seen before. He’ll divide opinion, considering he sounds like he’s on helium. There are some unforgettable moments from Gyllenhaal here, and while his character fits in with the film’s exaggerated tone, that high-pitched voice does him no favours. Paul Dano’s character Jay, the leader of the ALF, is consistently engaging, helping to drive the action forward. After an upbeat first act, the latter half is surprisingly dark, reminding us that Okja is a film you can’t predict. It goes from a sunny mountain setting to bloody scenes, all while hitting you right in the feels. All these varied tones might not work for everyone, but it’ll make you pause and take a look at our conception of animals. Inconsistent, yet always entertaining: Okja is the funniest, weirdest film Netflix has ever made. Whatever you make of it, it’ll be one of the most unique films you’ll see this year. 4 out of 5 stars. Couldn’t have said any of it better myself. Seriously, I found the film so weird that I had trouble writing a review LOL I do admire the risks the filmmaker took and this is definitely an unforgettable film.